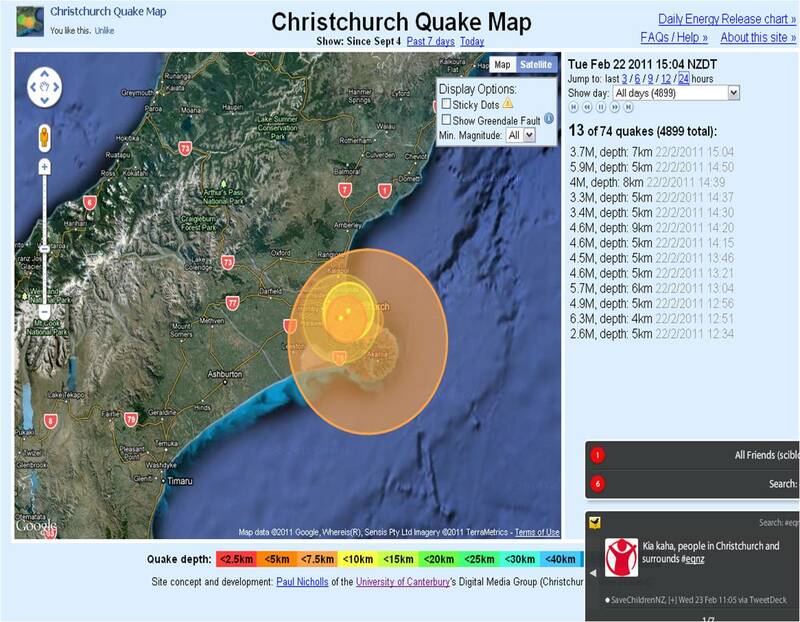 Sciblogs | Christchurch Earthquake: Holy ****! I didn’t feel yesterday’s quake*. Sitting in Wellington, I would still have expected to (our building shakes pretty easily), but I was instantly aware that something was afoot when Twitter lit up with variations on the theme ‘holy ***, HUGE quake #eqnz’. I’ve been glued to Twitter ever since, as messages fly around the country offering (and asking for) help with finding people, organising resources, beds, money, blood, standin work, etc. There have also been a number of visualisations of the quake turning up, of which one of the best thus far has to be this one, from Paul Nicholls at the University of Canterbury. Although of lesser magnitude than the Darfield quake, its proximity to Christchurch, the extreme shallowness at which it occurred, and of course the weakening suffered by many buildings last year, means the quake’s effects have been more devastating**, with widespread devastation as well as loss of life (currently, some 300 people are still missing). If you have beds to offer those in need of them, the best site so far is this one. If you need help, you can post here. Another bed site is Quake Escape, here. findaroom.danielwylie.me also has info for finding beds than does quakebeds. Good site. Trademe‘s now gotten a dedicated section up on its website, with sections on accommodation, transport, volunteer labour and lost and found pets. Also, I just heard that eq.org.nz has now had 100,000 visits! Quakeaid‘s another new site which has gone up, which aims to connect people who need help, with those who can offer it. 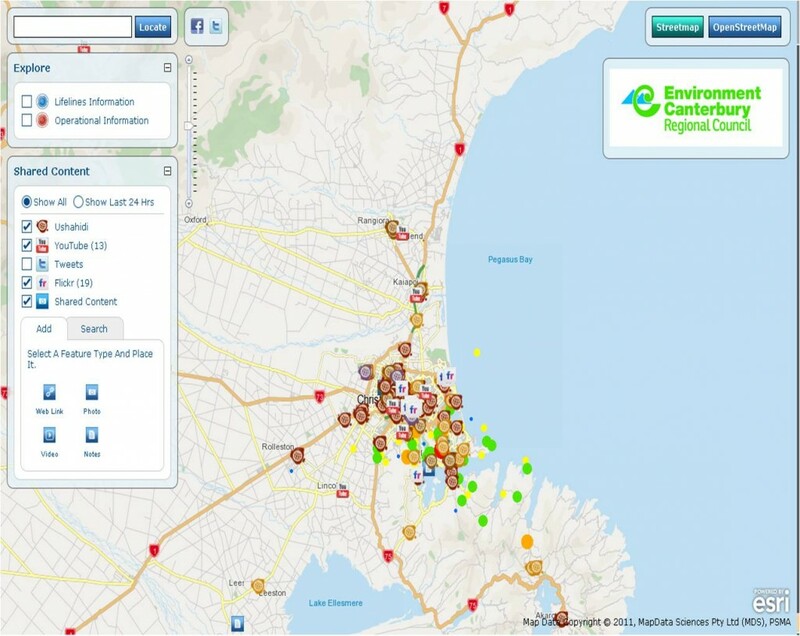 The #chch twitter stream is a little easier to follow; #eqnz moves way too fast for me. #chch was originally mostly formal information but now has a lot of clutter, which is a shame in some ways. Grant and others, thanks for all the info. It is invaluable having these information sources. Good to hear you’re OK, Michael. You could use the group back channel (google group) to reach us, as well? Comms must be patchy in ChCh. Trying to suggest to brother & partner w/ baby due yesterday they can come to Dunedin if better for them, but no replies to texts to any of my familyâ€”3 different locations in townâ€”yet I see others are tweeting away! Michael – are you OK for accommodation? We could offer a bed or two in the short term – we have the very elderly Ps-I-L coming to stay on (I think) March 7, but up to then should be OK.